Imagine a stylish new car museum – one that combines displays of some of the most priceless, all-time greats of the automotive world, with state-of-the-art interactive displays and future technology. Imagine that this new museum sits in 160 acres of landscaped grounds which include a workshop, special display areas and, best of all, a demonstration road on which museum cars will be exercised several times a day. Imagine that this museum is the brainchild of one of the biggest, most important auto collectors in the world – a man with a strong history not only of great car ownership but also of great car museums. Sounds good? Sounds amazing! It could feasibly become one of the world’s top five car museums, up there with such gems as Mercedes-Benz World, the Porsche museum and the Petersen – especially when you consider that £150 million would be invested in the project. OK, so where would it be? The USA? Germany perhaps? Or how about the Cotswolds – that characterful area of the UK roughly between Stratford-upon-Avon and Bath, so beloved of the better-off middle classes. Yes, great, you think; and if you know the area, you’ll know that it sits smack in the middle of an amazing tranche of automotive and motorsport businesses, and close to some of the UK’s best-served public transport links. But surely there’s a problem? Where in the Cotswolds could a museum and surrounding 160-acre plot possibly sit without causing a Middle England meltdown? Now you’ve probably guessed we’re going to give you the answer to that, and it’s remarkable. Firstly, though, it’s important to understand that this is absolutely not a pipe dream, and it’s already gone so far as for locals to have been consulted, detailed schemes drawn up and outline planning permission applied for. The site is surrounded by rolling countryside, which you might think counts against it. But the site itself has long been home to an operating track-day school, Vision Motorsport, with permission to run eight sports cars and six rally cars at an average 75 decibels noise level, never to exceed 83dB – and it has never breached those rules. It’s bordered by an airfield with not one but two operational flying clubs, a rapidly expanding clay-pigeon shooting club and an unsightly industrial estate. It is not a pretty place. And it doesn’t take a genius to work out that a brownfield site such as this would be manna from heaven for housing-estate developers were it not for the current museum proposals. There are three mainline rail stations nearby: Oxford, Banbury and Charlbury, the last of which is just six miles away. One more thing: the site sits on an historic estate. The sale of assets as part of the museum development would be used to finance the £12.7 million restoration desperately needed to the derelict Grade 2 mansion, parts of which date back to the 16th century, at the centre of the estate. And now you need to know who’s involved: think Bugatti, think the aforementioned Petersen Automotive Museum, think Pebble Beach. For this is the scheme of none other than businessman and philanthropist Peter Mullin, founder of the famous Mullin Automotive Museum in Oxnard, California. The Mullin Automotive Museum is home to the world’s greatest collection of Art Deco-era cars, including the Bugatti Type 22 pulled from Lake Maggiore after more than 70 years underwater, the remarkable Hispano-Suiza Xenia and one of the three surviving Bugatti Atlantics – which has just won the coveted Peninsula Classics Best of the Best award (below), effectively proclaiming it as the greatest car in the world. Peter Mullin is also chairman of the Petersen Automotive Museum, president of the American Bugatti Club, serves on the Advisory Boards of the Autry National Center and the Guggenheim Foundation, has won countless concours awards and is one of the most popular personalities in the top-end collector car world. Why now, why this and why the Cotswolds? Says Peter: ‘I’ve had a home in the UK, in Scotland, for about 35 years, and I love that part of the world. And the Cotswolds is somewhere I’ve had the chance to spend a significant amount of time over the past few years, and I think it is just spectacular. ‘You combine the location with the fact that this is the motorsport centre of the UK: with the exception of Ferrari and a couple of others, every Formula 1 team is within 30 miles of this site. Then when I think about how close it is to London, available by car in 90 minutes or via three mainline railway stations and shuttle buses, that kind of made it a natural. ‘So if I was going to create a museum to share our passion with Europe and Great Britain, then this seemed like a natural spot. And Great Tew is about 4000 acres of absolutely perfect location. With Blenheim Palace so close, with Bicester so close, then you add that together with the Enstone Airfield site, which was frankly a rundown, bleak, brownfield site in need of development… all those critical pieces were coming together. 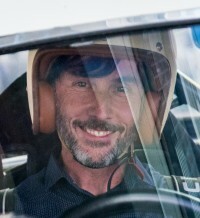 So Peter has given the game away: the location is Enstone Airfield on the Great Tew Estate, six miles from Chipping Norton – and close to the new home of David and Victoria Beckham, as well as the chic new Soho Farmhouse development. Interestingly, it’s also just three miles from the Renault F1 team HQ, which employs 600 people. Still, there is of course a danger that any new development open to the public could cause traffic problems, which is likely to be local residents’ greatest fear. The team behind the museum proposal is expecting a maximum of 200,000 visitors a year, including children. The proposal – named The Mullin at Great Tew – addresses this by keeping hours to 9.30am opening and 4.30pm closing times, and running the ticketing on the now-familiar method of pre-booked time slots, likely to be 9.30-11.30am, 11.30am-1.30pm, 2.30-4.30pm, or similar. This is to prevent museum traffic from coinciding with the morning and evening rush hours. Additionally, visitors will be encouraged to arrive by train, with shuttle buses laid on by the museum between stations and the venue, as well as discounted entry for those arriving by public transport. There’s no doubt, though, that traffic will increase during the day. However – and this is crucial – it’s likely that any alternative development of the site, such as a housing estate or an expansion of the existing industrial estate, could bring more intrusive traffic, particularly during the crucial rush-hour periods. The most vocal objection so far, from local landowners and fronted by Star Trek actor Sir Patrick Stewart, is that the plan is ‘elitist’, perhaps misunderstanding that the museum will be open to all, and will include educational opportunities for school children and college students. ‘A key objective of the project is that it will serve visitors of all ages, rich and poor, young and old,’ asserts project director Kieran Hedigan. ‘This is a destination that will inspire the grandparents and the grandchildren and everyone in between. AutoClassics has visited both the Mullin Museum and the Petersen in Los Angeles on many occasions. It's well-known that they put education at the forefront of their priorities via collaborations with Pixar, Microsoft and Disney, and that both museums are open to all, with affordable entry prices. Sir Patrick is also quoted as saying that the area is of ‘notable beauty [and] tranquillity and is accessible to all’, although it is actually a privately owned brownfield site, with derelict buildings, the remains of an airstrip and a track-day company in operation. We know the site, and can confirm that it’s scruffy and bleak, the view currently dominated by industrial buildings, and complete with the obligatory abandoned car in the middle of the area proposed for the museum. We took the pictures below in January 2018. Some have described Peter Mullin as a ‘property developer’, although he’s never been that, and is well known in the car world for his philanthropy and interests in sustainability and education. The Mullin at Great Tew plans are still in outline phase only, awaiting the verdict of the planning-permission application, but it’s still an impressive proposal even at this stage. From the outside the 60,000sq ft museum appears to grow out of the landscape, with significant proportions of the building effectively underground, except at the cutaway front aspect. The current proposal is for the roof to be steel, in Goosewing Grey to blend in with the sky, and with a large overhang to shelter the balconies below. The museum would be built around a central atrium, from ground floor to roof, with three floors of galleries arranged around that atrium. Visitors would start from the top floor and work down through the various displays. Already, the Royal Academy of Arts, the ArtCenter College of Design (the picture below shows Peter and Merle Mullin with ArtCenter students), and the Victoria and Albert Museum have expressed interests in getting involved. Education, from school visits to scholarships, would be an integral part of the project. Beneath the museum would be a basement storage vault, allowing room for 200 cars in all. Around 70 of these would be displayed in the museum, on a regular rotation. Peter has committed a minimum of 25 of his own automobiles, again on rotation, to the displays. All the serviceable museum cars would be exercised regularly on the demonstration roads outside the museum, allowing every visitor to see vehicles in action during their visit. A workshop, planned to sit just inside the main gates, would be used to service and maintain the cars, with more involved jobs farmed out to the many local specialists – Bicester Heritage is just 15 miles away, for example. Visitors will be able to view work in progress in the workshop. On the other side of the site, a small customer centre is planned, pencilled in as the Bentley Pavilion due to the interest that Bentley Motors has in the proposal. This is strong sales territory for the marque, as its customer base is much more at home in the Cotswolds than in the company’s hometown of Crewe. Alongside the demonstration road will be the Showlane, a 100m-long building, complete with mezzanine level and balcony overlooking the demonstration road. It will be divided into six separate units, suitable for car manufacturer customer centres, corporate events or exclusive retail units. You may be surprised to hear that 28 holiday lodges are also planned on the site. But think about it – if you were one of the world’s leading car collectors, already with a house in London, at Pebble Beach, perhaps at the Thermal Club track in Palm Desert, and wherever else life takes you… wouldn’t you want a place in the grounds of a leading car museum? The 28 lodges would be spread across the site, each one nestled in the trees. The proposed designs are for high-tech, stylish eco-houses, with any cars kept out of sight in basement parking areas, and the estate serviced by electric vehicles. Residency would be on holiday-home terms only – that’s a maximum of 48 weeks a year – and available only to collectors who are willing to display their cars at the museum. It’s the sale of these houses that will finance not just the museum but also the restoration of Tew Park. Without the lodges, the project will not be financially viable. What is the Great Tew Estate? The Great Tew Estate includes the picture-postcard village of Great Tew, a working farm and the only operational ironstone quarry in the UK, and has been the site of the annual Cornbury Music Festival. Although its history dates back several centuries, its current form was defined initially by the Boulton family, founding fathers of the industrial revolution, who took over the estate in 1815. In 1877 it was described as ‘one of the best-farmed parishes in the Midland Counties’. As an interesting footnote, Matthew Boulton and James Watt’s pioneering work producing steam engines is honoured on the UK’s current £50 note. During the early 1900s the estate fell into public stewardship, and was neglected until the 1990s when the Johnston family took over the stewardship. First James Johnston and now his son Nicholas have transformed Great Tew, restoring buildings, installing a sewerage system and bringing the farms back into profitable business. Tew Park, the mansion house at the centre of the estate, has been unoccupied for more than 20 years, and is in need of complete renovation. It’s referred to locally as ‘25,000sq ft of dry rot’. The proposed Mullin at Great Tew project will finance its restoration, with the full co-operation of the estate. The mansion has planning permission in place, and would be restored at the same time as the museum project emerges on the airfield. The outline planning application is with West Oxfordshire District Council. Clearly a project of this scale needs full and proper consideration, but a decision is expected in April or May 2018. If outline planning permission is given, then the next step will be for architect David Hunt to head a team to draw up more detailed plans, which will then be submitted to the local council. David expects that it will take the rest of 2018 to get to this stage. If planning is agreed, then the build of the museum will take a further 18 months at least, taking it into 2020. The cost of the entire project is expected to be £150 million, privately raised, without any reliance on grants or Lottery funding.